I was born with Duchenne Muscular Dystrophy. This causes my muscles to grow weaker over the years. It was discovered when I was two years old. By the age of nine I couldn’t walk, so I got a scooter. I attended the primary school in our village. I did well at that school. I knew Ruud van der Wel from the swimming lessons I attended every Wednesday afternoon. After finishing primary school, my parents and I decided that it would be best for me to attend a school for students with special needs. 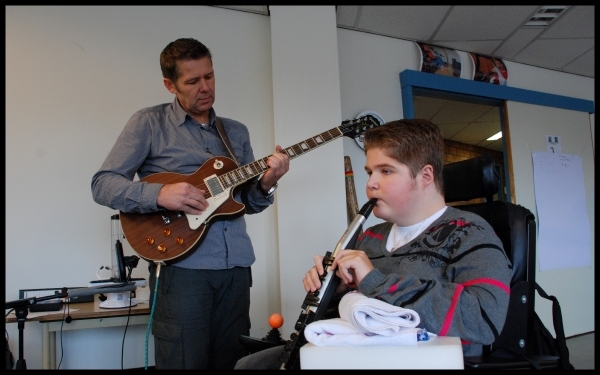 The school’s name is “Mytylschool de Brug” At that school I was given respiratory therapy using musical instruments. At one point, in collaboration with two physiotherapists, Ruud started a pilot study. The intention was to plot my progress over a period of 12 weeks. I played 3 times a week. I had to fill in a logbook and explain how tired I felt after playing. I found respiratory therapy to be fun, and still do, because I like music very much. My father and I often go to concerts to see bands like U2 and Coldplay. When I am playing music, my father picks up his guitar and accompanies me during the songs. My sister is also musical. She recently started to play guitar and takes singing lessons.